Last year, all my tomatoes ripened at the same time, in August. But the seeds (Rutgers) and the plants (grafted Mighty ‘Matos®) were given to me so I couldn’t complain. 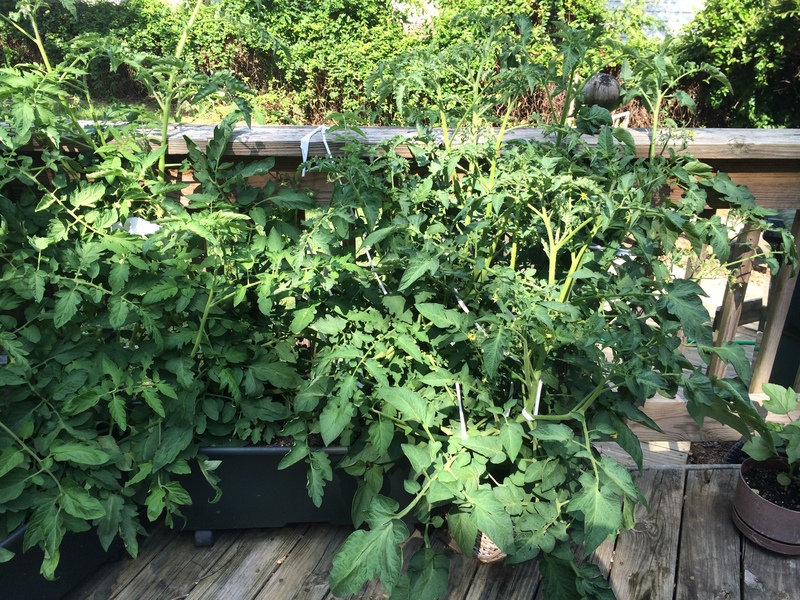 I had three EarthBox® containers, each with a Mighty Mato and a Rutgers side by side for a total of six plants. Between the two types, I saw no difference. Both performed well, both grew to the same height, and both had the same yield. However, I think this is because they were grown in EarthBox® containers on the deck. I have been growing tomatoes in EarthBoxes® since we have lived in this house and have never had issues with tomatoes. This year, I had planned to space out the harvest time so I bought a seed packet of an early season tomato, Stupice. Before I was able to buy more seed, I was given seed packets of Abraham Lincoln and Rutgers so what could I do but plant all of them. Growing tomato from seed is easy; you can even do it in egg cartons indoors. These particular tomatoes are called “slicers,” fruit large enough to slice for sandwiches. Tomato plants also are classified as determinate and indeterminate. 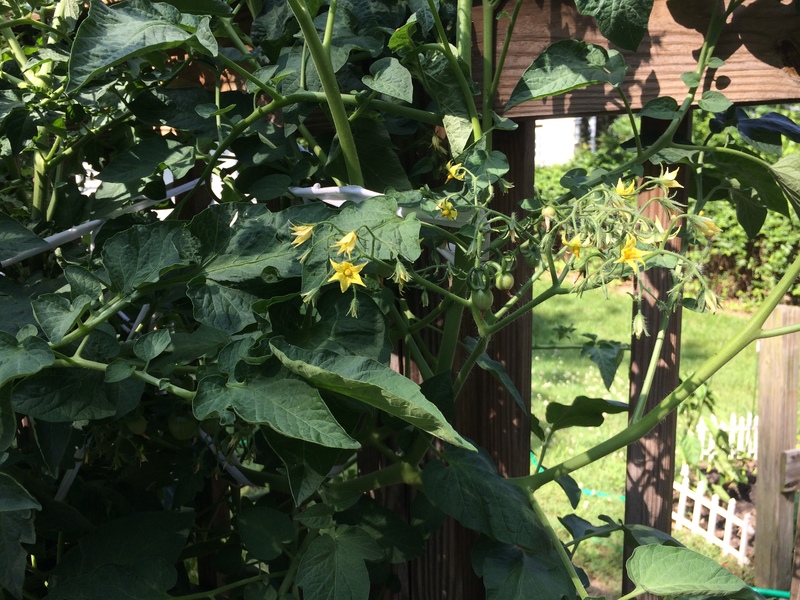 Determinate plants stop growing after the flower buds set fruit so you harvest tomatoes for a few weeks tops. The plants are bush-like, 2 to 3 feet tall. Indeterminate plants are vine like; the plants will keep growing and producing new blossoms even after the fruit sets. You can harvest all summer long. Stupice, Rutgers and Abraham Lincoln are heirloom indeterminates so I will be picking for a while but this year, I may try saving seed to grow more tomato plants next year. So far, they are all doing well. I have two of each in each EarthBox for a total of six plants. There is so much lush green growth that I tie the vines to the wooden deck rails with torn up old shirts. As of mid-July, there must be a hundred little green tomatoes. Every day I look for that first blush of red. The Stupice is the best so far — great shape, does not flop over too much, and candelabra-like flower clusters that seem to hang in mid-air. 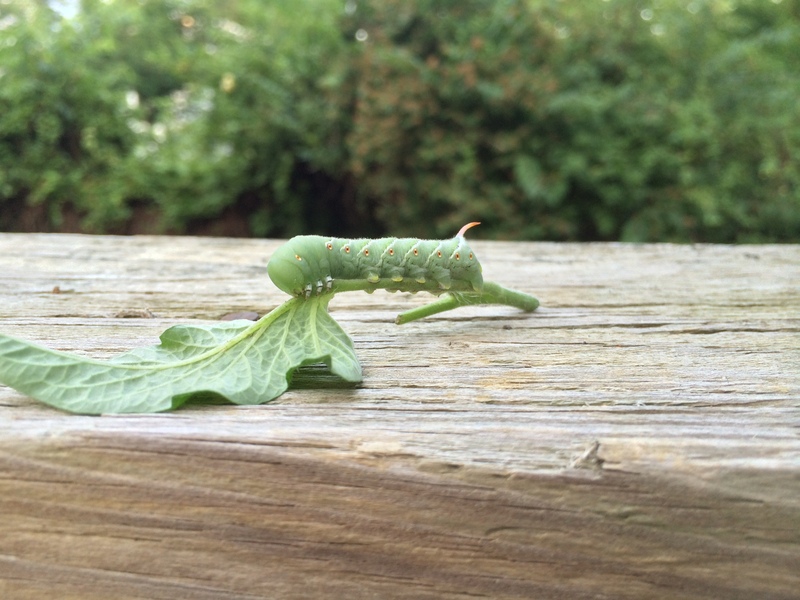 Usually I have no diseases or pests but last week I spotted one tomato hornworm which I picked off and have not seen any more. 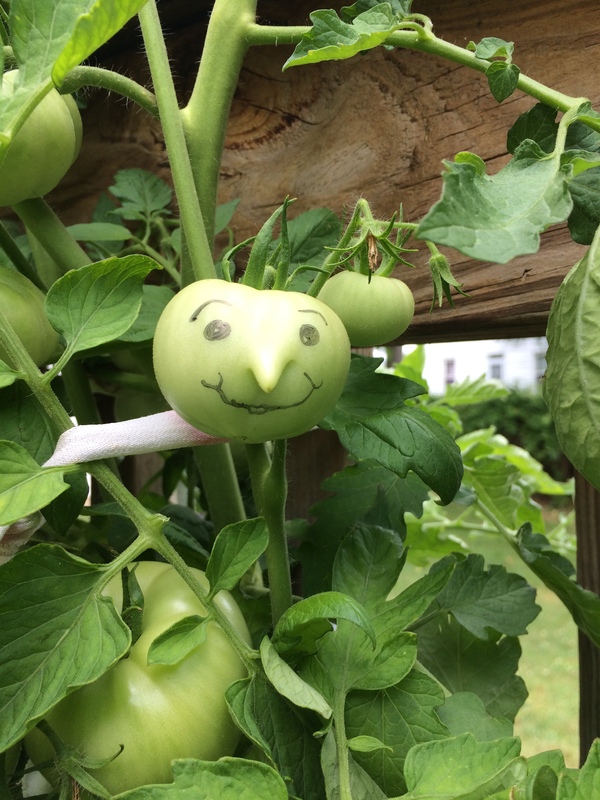 Yesterday, tomato man peaked out from under the foliage but he’s a friendly. We like to use the tomatoes in BLT sandwiches, salads, or just cut up raw with herbs. If I get too many I boil them for a few minutes, peel off the skin, and freeze in a bag. Later they go in the bean stew. For a special treat, we make bruschetta: top slices of French bread with a slice of tomato, a basil leaf, and a little cheese and broil for a few seconds. That’s summer! This entry was posted in Uncategorized and tagged Abraham Lincoln, EarthBox, Mighty Mato, Rutgers, Stupice, tomato, Tomato hornworm, tomatoes. Bookmark the permalink.